Rupert Goold's immediate and visceral film, starring Patrick Stewart and Kate Fleetwood, is set in an undefined and threatening central European world. Shot on location in the mysterious underground labyrinth of Welbeck Abbey in Nottinghamshire, Goold's cinematic re-interpretation is a contemporary presentation of Shakespeare's intense, claustrophobic and bloody drama. in 2007. Patrick Stewart won Best Actor and Rupert Goold Best Director in the Evening Standard Theatre Awards for the play, and both Stewart and Fleetwood were nominated for Tony Awards. Described as 'the hottest, most exciting director around', Macbeth marks Goold's debut as a film director. When the film was screened on BBC4 in December 2010, the film was the subject of enthusiastic critical praise. 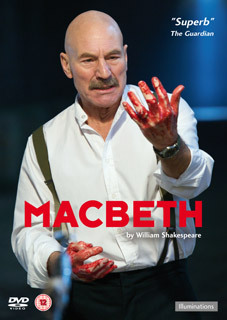 Macbeth will be released on UK DVD and Blu-ray in the last week of June 2011 (exact date to be confirmed) by Illuminations at the RRP of £17.99 for the DVD and £21.99 for the Blu-ray. Interviews with Rupert Goold, Patrick Stewart and Kate Fleetwood.